Kassandra & Stan’s wedding was everything that The Great Gatsby was — elegance, glam, and roaring fun. 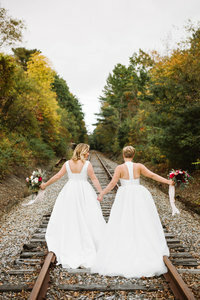 They have been together for 4 years as a result of being set up by their best friends who were their maid of honor and best man. The Abraham’s chose to have a chic theme as Kassandra loves The Great Gatsby film. Their modern black tie wedding was absolutely gorgeous with gold and pearl accents. The ceremony was filled with so much contagious enthusiasm from all of their friends and family. No one could have expressed greater joy for the newlyweds and greater joy for their faith as Kassandra & Stan’s friends and family. Their first dance as husband and wife was incredible. They danced to two songs and had a *fog machine*! Congratulations to Mr. & Mrs. Abraham who will have a roaring good time in New Orleans for their honeymoon!